The Implementing Rules and Regulations of Republic Act No. 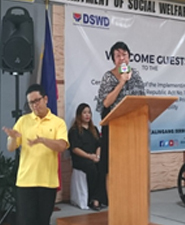 10754, also known as the “Act Expanding the Benefits and Privileges of Persons with Disability” was signed in a simple ceremony led by DSWD Secretary Judy M. Taguiwalo, with NCDA Acting Executive Director Carmen R. Zubiaga and DOH Undersecretary Gerardo Bayugo (representing Secretary Paulyn Jean B. Rosell-Ubial, MD). The momentous event was held on December 1, 2016 at the DSWD Central Office in Batasan Quezon City. Witnessing the signing were the principal authors of the law, former Representative Ferdinand Martin Romualdez and Senator Juan Edgardo “Sonny” Angara, as well as Cong. Yedda Romualdez, Rep. Imelda Calixto-Rubiano, DSWD Undersecretary Florita Villar and representatives of the Sector of Persons with Disabilities. Also in attendance were members of the Drafting Committee which crafted the IRR, Disabled People’s Organizations, Mercury Drug and other invited guests. In her message, Secretary Taguiwalo said that the IRR reflects the spirit of the law as well as the stories and aspirations of our “ kababayans” from the PWD Sector. RA No. 10754 aims to grant persons with disability at least 20% discount and exemption from the value added tax on the sale of certain goods and services identified under Republic Act No. 9442 for the exclusive use, enjoyment or availment of persons with disability. Nag try Mom ko na bumili ng gamot for my father (PWD) at Mercury drug kaso hindi parin daw xa honored. Meaning, still with VAT parin yung purchase. As per their reason, the mercury drug implementing rules for this has not yet been documented and circulated across their branches. Is that fair/acceptable reason? I understand software updates for their POS/Retail/Finance Management systems will take time, but my take there is they can always do it manually. Is Mercury drug or any other drug stores can use that kind of reason? That is obviously a delaying tactic. Can NCDA do something about it? I am one of those caring for and living with a PWD. Section 14 of IRR od RA 10754 provides that there are incentives to be given to us like additional withholding tax exemptions. I was asked by our office on the legal basis since I am asking for additional exemptions. Said section also states that the BIR will formulate revenue regulations pertaining to the said incentives. I called BIR and they told me that there is still no regulations formulated on the expanded benefits on PWD. Can you kindly facilitate the development of policy/guidelines on this matter since we cannot avail of these incentives without the specific guidelines. Thanks you and more power to you! Hi, Would like to clarify on the additional tax exemption for parents with PWD children, is this in top of the already deductable P25,000 additional tax exemption each dependent of married individual? I want to report that Mercury Drug store still charges VAT for purchase of basic necessities and they limit purchase of an item to one. I still have the OR receipt of Mercury Drug Don Antonio which is quite close to your office. Can someone look into this? Kudos to NCDA, DOH and to the different government agencies collaborating to come up with an expanded benefits for the PWDs. Parent’s role in attending to the personal needs of special children is very crucial. The need for parents-special kids partnership is very vital in the behavioral development of children with disabilities. As a mother of special kid with autism, I feel the need to be with them during PWD celebrations, sports fest and other school activities. It boosts their morale and they feel being loved and cared for. However, we are constrained of just trusting them to their yayas or caregivers because we have work to attend to otherwise, we will be deducted from our salaries for being absent from work. In this regard, we would like to request that parents of special children be granted additional leave credits (similar to the solo parent act) on top of the 2.5 VL/SL accorded to government employees. Such additional leave will give us time to address the concerns of our kids with special needs. We hope this request would be given due consideration and appropriate action.